As we all undoubtedly know, there are all sorts of different wolves out there. These pages are here to hopefully give some knowledge on them, and to give all wolf lovers out there a nice place to look. If you have any ideas, noted discrepancies or comments on this page, would you please email me. All information and knowledge is readily accepted. Contact Information is also at the bottom of the page. Wolf n, pl wolves 1. a predatory doglike wild animal which hunts in packs. There really is very little information on wolves for the browser to read in books. As in the above extract from the dictionary, there is no depth, and no real interest in the subject. There is a fear that is attached to wolves that had evolved over the years. As children we were brought up with fictitious stories our parents used to tell us, such as Little Red Riding Hood, and the Three Little Pigs. These stories were meant to teach us all about obeying our elders, and being good citizens. In fact, the stories really are quite gruesome, and it is no wonder that children might grow with bad habits if they are taught about violence being a good thing (the woodcutter killing the wolf). I always felt sorry for the wolf in that story, as it obviously had no pack and had no other food source to rely on. Perhaps the woodcutter should have stunned and tied the wolf up and called a wolf protection society instead! It seems then that these, and other stories grew from lack of knowledge. I feel that if people were better educated in fact instead of fiction, and then the world would be a more tolerant place in which to live. In these pages I hope to shed some light to you folks out there who have little knowledge of wolves, and tell you what are their real habits. I will also put some reviews of better fictitious stories at the end of the site (still under construction) for those of you who like that sort of thing. Werewolves will also be mentioned, and possibly a page dedicated. If there is anyone who has material either fact or fiction that they might want to submit, feel free. This is not just my site, it is for wolf lovers everywhere. The most many of us know about wolves is from what we hear from the aforementioned bedtime stories, and that they are like wild dogs. They are supposed to be things that terror is made of, cold-blooded killers.In fact there has never been any confirmed attack and killing of a human by a healthy wolf. The domestic dog has a lot in common with the wolf as it evolved and has been bred into being from the wolf over 20,000 years. It took this length of time to get all the different species we know today from the St Bernard to the toy poodle. Not only does the domestic dog share its ancient ancestors with the wolves, but also still have the characteristics of the wolf in their behavioral patterns. Understanding the behavior patterns of the wolf will help you to understand how your dog thinks. We can misunderstand and misinterpret what our dog is trying to tell us as the dog does not “speak” the way we do. This can lead to us putting human characteristics and actions on a dog so better to understand what it is saying, but this is often wrong. There is a great book on this that I have found by a man named Stanley Coren, “How to Speak Dog: Mastering the Art of Dog-Human Communication”. (ISBN 0-684-86534-3). I recommend this book highly. There are two species of Wolf, the Red and the Gray. The Red wolf (Canis Rufus) is the smallest of all the wolves. They usually weigh 50-70 pounds and stand to about 51-81 cm (20-32 inches) tall to the shoulder. They usually have a reddish-brown coat, and are smaller than the gray wolf, have smaller packs than the gray, which are usually consist of an adult couple and their offspring. They mate every year and have an average of 2-5 pups. Both the male and the female look after the offspring. The pups stay with this pack and it’s mother until it is about 18 months old when they can fend for themselves. They will then travel away to set up a pack of their own. The Red Wolf can be found as far north as Pennsylvania and as far west as Texas. They like temperate deciduous forest areas, and need between 10 and 100 square miles of habitat to live and hunt in. They like to eat white tailed deer and raccoons, but can eat any small animals if pushed. 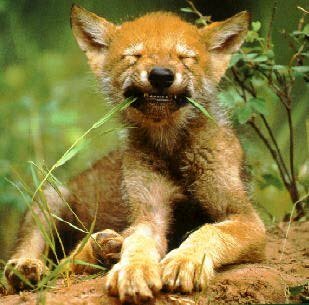 In recent times there has been a loss of the Red Wolf’s habitat, due to the expansion of agriculture, logging and human settlement. With the combination of the hunting of wolves that takes place (they preyed on cattle), coupled with the fact that the red wolf has been mating with coyotes, and coyotes expanding into their territory, the red wolf numbers have dwindled. Also there happened diseases such as heartworm, which preyed on the wolves. 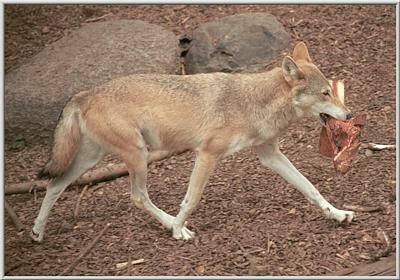 In 1967 the Red Wolf was made an endangered species. In 1980 the Red Wolf was declared extinct in the wild. Currently there are only 300 Red Wolves in the world, and only 75-80 of them surviving in the wild. There are fourteen recognised sub-species of the Grey Wolf. The gray wolf (Canis Lupus) is the largest and most common type of wolf, 2-2.5 ft tall and 4-5 ft long. The males are about 100-175 lbs and the females are slightly lighter. Unlike common perception, they are not as large as they seem because of their thick fur; in fact they are about the size of a good-sized Alsatian. Although they are known as the Grey Wolf, their color can vary from pure black to pure white, and through gray and brown, or a combination. Like most wolves, they usually mate for life, and breed in late winter and conceive about two months later. The pups are born blind and are reared in a den and weaned in about the 5th week. When they are 3-5 months old, they are old enough to run with the pack. They will be adult size by winter. Grey wolves are sexually mature at the age of about 22-24 months. They were formally found throughout the northern hemisphere in Alaska, Canada, the region around the Great Lakes. They were hunted to extinction in all other areas of the country. The wolf population was lowest in Eurasia in 1930’s and 60’s, and lowest in North America in the 1950’s. In 1995 there was a reintroduction of the Gray Wolf into the wilderness areas like the Rocky Mountains. There were also 30 Gray Wolves reintroduced into Yellowstone National Park in Wyoming, Minnesota, and are thriving. There are also some in the Isle Royal National Park, Michigan. There are now 2,500 Gray wolves in the lower 48 states of America, and 10,000 in Alaska to date. The Grey Wolf is very important to the food chain, as, as it is at top it controls the populations of the caribou, deer and moose. The wolves take the sick and weak animals such as the older ones (they wouldn’t bother with a healthy moose that stands its ground), making sure that the strongest of the herds survive, and so making the herd stronger through this type of selective breeding. A good example of when this was not the case, was when in Yellowstone National Park. There were no wolves there, and the populations of these herds multiplied extensively, ended up over grazing the land, creating a food shortage, and many of these animals died from this. The wolves have been reintroduced here and the balance is even again. There are also as many as 30 sub-species (only 14 of them are recognized) of the Gray Wolf, such as the Mexican wolf, which is indigenous to the Southwestern Deserts of America. The Arctic wolf (Canis Lupus Arctos) is the purest of all the wolf breeds, as it is in such an isolated area in the Arctic Circle. 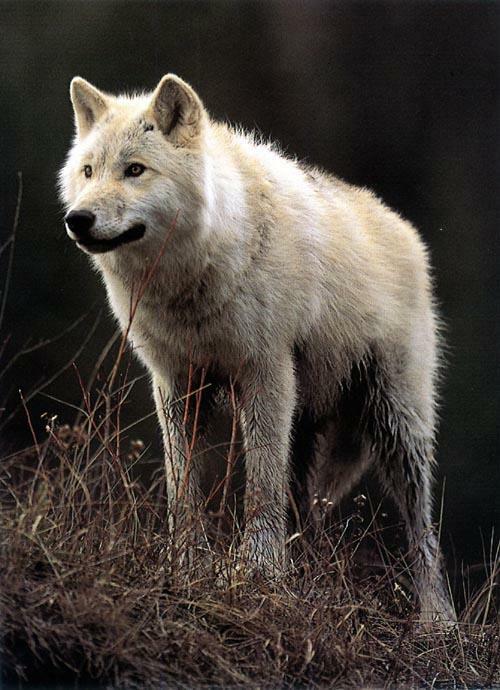 They can be easily recognized, as they are the only Grey wolf sub-species with a thick, near-white coat. Their coat protects them from predators through its camouflage, and the warmth that they need to survive in the Arctic temperatures. They are about 3-5 ft long, and about 25-31 inches high to their shoulders. The males can weigh up to 175 lbs, but the females are lighter than the males. This extra body mass is for the warmth. Their ears are smaller and rounder than the other sub-species of Gray wolf, and their muzzle and legs are slightly shorter. These differences are the adaptation to the cold, as they decrease exposure to the cold, as they have to endure temperatures that reach –57’C (-70’F). Arctic wolves reach sexual maturity at 3 years in the males, and 2 years for the females. The gestation period is about 53-61 days, and they usually have about 1-6 pups. The pups are born slightly later than the wolves further south, usually around the end of May. Like the other types of wolf, the Arctic Wolf has very tight family bonds, and other younger members of the pack will often look after the pups while the mother is away hunting. The Arctic wolves have been known to have up to 30 members a pack, but usually only have about 7 to 10. They have a vast territory, as their prey is small and less frequent in the finding. They live throughout the Arctic landmass, except for the on the permanent ice sheets on the sea, and can have more than 1000 square miles (2600 sq km.) of territory. Their main food sources are arctic hares, musk ox, caribou, lemmings and some birds. As the food is so scarce in the Arctic, there is rarely anything left of the carcass, such as with the arctic hare, as they will eat the skin, fur and bones. The Arctic Wolf has a life span of about 7 years on average. Unlike the other types of wolves that have been persecuted by humans the Arctic wolf is thought to still have 95% of its territory in the Arctic. They only have to worry about fur trappers, oil drilling and hikers in the Arctic. Due to the bad weather conditions in the Arctic, we can only know what happens to the Arctic wolf in the summer, as it is both too dark and too cold to see anything in the winter. Wolves can live in a variety of areas from the Arctic Tundra to forests and prairie as long as there is adequate prey for them to live on. The greater the amount of prey, the greater the numbers will be in the area. The only place they cannot live is in tropical forests, desert floors and the highest mountains. Wolves, although very similar in look to an Alsatian, have a broader skull and longer ears. They also have a bushier tail, a long nose and legs. They look lean and rugged like a coyote, but they tend to carry their tails higher. Wolves have territories of varying size, from about 30-more than 500 square miles. They use scent markings and vocal calls, such as howling to define their territory from other wolves. There can be a range of numbers in a pack, up to about 30 depending on the hunting in the area. Wolves are very social animals. They travel in packs. This can range from the lone wolf up to twenty individuals in any one pack. The Wolf packs are very family orientated. We can see this especially when it comes to rearing young. All the members of the pack show great care when it comes to the pups. They are extremely tolerant, and other members of the pack will adopt the young if the parents are unable to care for them. Other wolves in the pack will often act as babysitters to the cubs, if the parents are busy, and are friendly and amiable towards the pups. There is a very strict hierarchy in place in the packs. There is an alpha male and an alpha female who rule the pack. They are the only ones within the pack who are allowed to mate, and although they usually mate with each other, being alpha also means that they can choose their mate from anyone within the pack. It was thought for a long time that it was the alpha male that ruled the packs, but it has now been proven that the alpha female can control the pack, while the alpha male could just be the highest ranking male there. I know of at least one pack that is ruled by the alpha female. Below the alpha male and female, the pack all knows its place in the hierarchical structure of the pack. Wolves do not fight unnecessarily; in fact they go to great lengths to avoid it. Most disagreements rarely end in serious fights. If, however, either the alpha male or female dies, or gets killed, there can be in-fighting within the pack to gain the position. Wolves have a very varied and complex communication system. To us, who are used to a more vocal language, it is hard to understand the extent of this. Wolves communicate through postures, looks, glances, a growl, howling, whimpers, whines, and barking. Most of the time a subtle movement of the body, or a glance is all that is needed to get across what is needed, especially when asserting dominance over another. They don’t often have to demonstrate their strength and dominance, but it is usually understood that they could if it came to that. Showing direct eye contact, which is seen to be aggressive, could show this. You can usually tell which members of the pack are the highest ranking in the hierarchy by how erect the tail is in the air. The higher the tail is, the higher the rank. This is why you see the alpha male or female with tails high in the air, and the others wolves tails lower. The howl, for which the wolves are most famous, is one of the most important communication systems, and is used for many reasons. The howl, unlike common myth is not to the moon, but to the others in the pack. 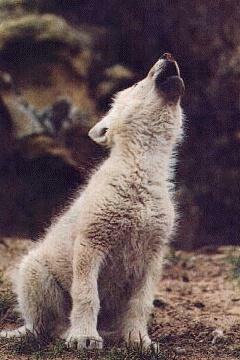 The howl is used to call and locate members of the pack. It is also a social expression and a greeting. It is used to define their territory, but also because they like doing it. There is also evidence to suggest that only some members of the pack are allowed to join in the howl sometimes, as the others attacked a lower ranking member of this certain pack when it tried to join in. This disfavored member could have brought this on if it had caused the leaders aggravation earlier on in the day. Sometimes, a member of the pack who is out of favor with the pack can be the sister of the alpha female or some other low ranking individual. The alpha female only tolerates her through the groveling the sister does to keep in favor, but sometimes this alone is not enough, and the individual can be driven from the pack. This wolf then becomes a lone wolf, who has no pack. This is very dangerous for that wolf, as it is more difficult to get food without the pack. It is also in danger from other packs that will attack it if it strays into their territory. Lone wolves only become a member of a pack if they are fortunate enough to find a pack that will accept them, or alternatively find a mate of its own who is in the same predicament, and start a pack of their own. Those lone wolves that do this are better off, as if they start a pack of their own then they are the alpha themselves. 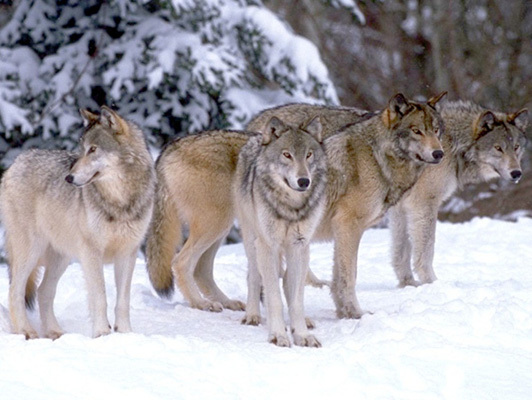 The pack relies heavily on group hunting, as they are usually quite a bit smaller than their prey. They need co-operation and coordination in order to feed the pack sufficiently. They rely on their sense of smell heavily; which is said to be 100 times greater than our own, to hunt. They can travel great distances while hunting. They have great stamina and strength, and can travel far for extended periods. Some wolves have been clocked at traveling 24-28 miles per hour. Although they cannot maintain great speed for any length of time, they seem to be able to trot indefinitely at about 5mph. In winter wolves use frozen rivers and lakes as travel routes. They also can travel between 15-25km in a single night. Usually wolves eat all that they kill, gorging themselves, as they did not know when their next meal would be. Wolves will often go for days without food, and then can eat up to 100lbs of meat at a time. Crows and ravens have been known to help wolves find food. The wolves make the kill, and gorge themselves, and the ravens get the leftovers. It is an unlikely partnership, but one that works. Wolves have been hunted for centuries. Their habitat has been destroyed through clearance of the land for settlement, and fuel. They have been seen mostly as a threat to humans as they were at the top of the food chain. They were also seen as a threat, as they preyed upon domestic animals because of their vulnerability. They have been hunted by poison, trapping, and shooting. Over the years, the wolf became a sought after prize. Wolf fur became a prestige object signifying bravery and valor. There were hunting parties set up to find and kill them, for no other reason than for sport, even when they posed no threat. With the expansion of the human race, the wolf numbers have dwindled, until they became extinct in many places across the world. There is now reintroduction programs being implemented across the world, to save the wolf from complete extinction, but poaching is still a very real problem and hazard. I have listed a few of the larger wolf organizations here, for those of you that want to help the plight of these hunted animals. I feel there is no reason for the hunting to persist, and it is up to people to put a stop to it, and lend their support for this worthy cause. Please send any comments or queries about these pages, and I shall get back to you regarding them. If you also would like to submit any pictures, short stories, or web links, these are also welcome. Please feel free to be as harsh as you like…making mistakes is the way we learn! As always, this site is under construction. I have been having slight problems with the computer, so if I have accidentally missed anything, or anyone out, please use the address provided, as I have probably just forgotten in the mayhem! I have made the utmost effort to get permission for all the images that I have used on these pages. If, however I have accidentally used anything that that is yours, and you wish to have it removed, please also contact the above address with the information.